This significant group from Dudley had four tracks released on a rare record album titled "BRUM BEAT" that was issued by Decca Records in 1964. They were discovered on the "Regan Circuit" along with other local bands who recorded tracks for the same LP. The Strangers became the nucleus of the well known West Midlands group Finders Keepers. 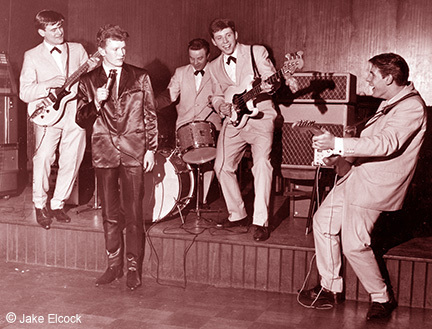 The Strangers originated from a local rock 'n' roll band called The Marauders, initially known as "Rob Roy and The Rockin' Marauders" who formed about 1960 while pupils at Dudley Grammar School. The Strangers were very active on Joe and Mary Regan's famous "Regan Circuit" of dance halls in the West Midlands which included The Plazas at Old Hill and Handsworth, The Adelphi (West Bromwich) and The Ritz at King's Heath. "Mersey Beat" (also known as the "Mersey Sound") was already all the rage in the UK thanks to The Beatles and other Liverpool groups. Cliff and The Shadows' recording manager, Norrie Paramor, came up with the name "Brumbeat" as a genre for the musical sounds emanating from the West Midlands (Brum is slang for the City of Birmingham). 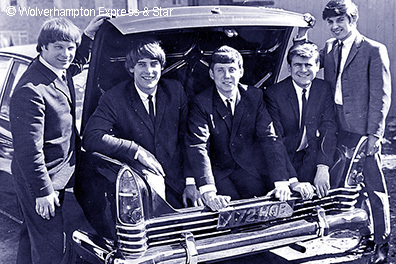 It was, however, Decca's Les Reed who jumped on the bandwagon as being first in 1964 with a showcase commercial LP (album) simply called, 'BRUM BEAT'. 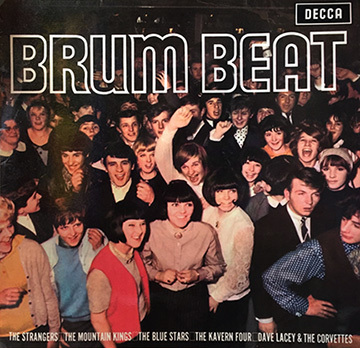 Ironically then, none of the five local groups appearing on Decca's Brum Beat album actually came from Brum itself. The line up was; The Blue Stars (Cannock); The Mountain Kings (Walsall); Dave Lacey and The Corvettes (Stourbridge); The Kavern Four (Cannock); and, The Strangers (Dudley). Whilst all five groups were deserving of their place on the album due their abilities and popularity, it is The Strangers (and their derivatives) who merit further study as also being a wellspring for some of the most famous names in rock music today namely, Trapeze, Deep Purple, Whitesnake, Black Sabbath and Giggetty. I have interviewed at length, three founder members of The Strangers namely, Geoff Crew, Ken Warr and Alan Clee plus, one later member, Tony Dalloway and this is their interesting collective story. Geoff Crew; "My parents owned The Regent Road Fruit Shop (opposite The Red lion) on The Tividale Hall Estate in Tipton but moved the business to The Arcade in Dudley in 1959 when I was 17. 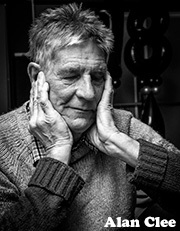 My brother Graham and I were always singing as we served and one day a customer (Mrs Melwish), who had just moved to the area from Surrey, said that I should meet her son Vic who used to play guitar in a skiffle group but, was now at a loose end because of the move to Dudley." "I met 21 year old Vic one evening along with his much coveted guitar at the time - a Hofner "Club 50" - and we ran through some numbers from Cliff Richard's first album which was full of covers of 1950's American rhythm and blues numbers and we also did the usual Lonnie Donegan favourites." "We went around with the hat at the end of the gig and raised thirty bob"
"After just two weeks rehearsal, Vic announced that he had got a pub booking which required that we went around with the hat at the end of the gig. We raised thirty bob which we shared. Overjoyed, I told my dad but he was dismayed and disgusted that I had been... "earning money for singing in a pub"! 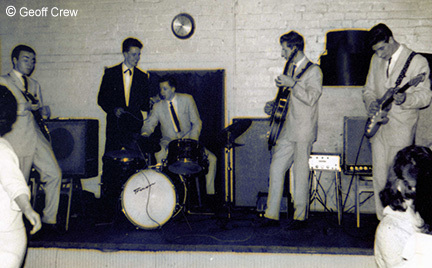 Undeterred, Vic and Geoff went on to recruit a few more lads and did gigs at local schools youth clubs in Oakham and also Parkes Lane Social Club in Woodsetton as The Crestas - Rob Griffiths (bass), Graham Crew (drums), Ralph Carter (guitar). Luckily, at 17 Geoff could drive, so borrowed his dad's van to transport the group and the gear to gigs. Having a shop, they also had a telephone so he handled all of the bookings and the money (very few homes had a telephone at the time). The Crestas lasted six months. Geoff Crew; "After a short while I saw an advert for a singer vacancy so, feeling quite confident, I attended an audition at The Blue Coat School in Dudley. It was there that I met 17 year old Ken Warr (bass) and 15 year old Alan Clee (guitar). It was late 1959/early 1960 and "The Strangers" were born. So began a rollercoaster of five nights a week bookings which gave them each an average income of 14 pounds per week - a tad more than the average weekly wage at the time. Additionally, of course, they also had their day jobs! They operated by what was known as "doing the door" i.e. the pub let them have the assembly room and made a profit from the "wet sales" and the group had all of the admission charge. Both sides were happy with this arrangement but eventually, promoters were soon to emerge and groups got a fixed fee. "...the regular group failed to turn up so we asked the manager if we could step in. 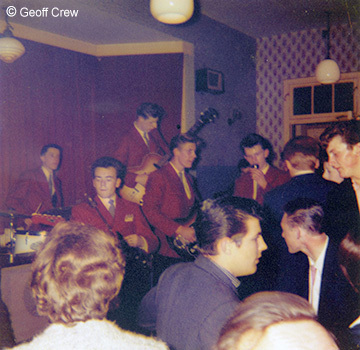 We took over and the crowd soon escalated to 200 a night"
Geoff Crew; "Apart from the bookings that I arranged we were fortunate to know another very popular group called 'The Jackpots' and it was their bass player Tony Bradley who put some gigs our way - gigs that they had ..."grown out of". My dad always stumped up the cash for equipment but, we always had to pay him back. The most costly item was a set of American-made Trixon drums for Graham in 1961 (as used by Ringo Starr) which cost 500 pound!" "One significant venue was The Victoria (The Old Vic) in Church Street, Princes End, Tipton. Alan and I went there one night and the regular group had failed to turn up so we asked the manager if we could step in. We took over the other group's spot and the crowd soon escalated to 200 a night - you can see from the photos, they were virtually on top of us!" I recall the admission charge being 3/6d. Our fee was seven pound ten shillings but, because we had increased the numbers our then manager, my uncle Ken, demanded, and got, a tenner. The pub manager was aghast. "I can't afford a tenner" he said. So, uncle Ken took the gamble and said, ..."a tenner, or no more Strangers!"... We played there regularly throughout 1960 and 1961"
"Brother Graham started courting and left The Strangers in 1962 (Graham later helped form the The Montanas). He was replaced by Mick Aston from The Marauders. The Marauders, established in 1958 as a skiffle group, were gaining prominence in the Dudley area but, at the time, only working one or two nights a week. When Mick left to join us they seemed to fall apart." "Alan Clee and myself met with the remaining Marauders and, because of their vocal harmonies suggested a 'merger' with The Strangers early in 1962. This resulted in personnel changes for The Strangers with Marauders lead guitarist Jake Elcock moving to bass replacing Ken and, Tony Dalloway replacing Frankie Burns on rhythm guitar." 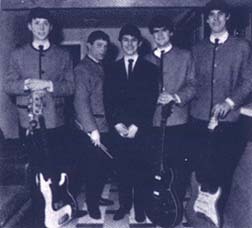 In their four years, The Marauders were host to Arthur Tighe, Eddie Cook, Norman Withers, Ralph Oakley, Jake Elcock, Tony Dalloway, Mick Aston and Roy Kent. Geoff; "All I can remember was The Strangers working most nights of every week throughout 1960 to 1963. We had little or no spare time to even rehearse!" "I bought a Hofner 'cello' bass brand new for 32 pound"
Ken Warr; "My family moved from Londonderry to the Black Country when I was four. I'm told I had an uncle who could yodel and I did a fair imitation of him that is, until I had my tonsils out"
"I left school at 15 just before Christmas 1957 and started work at E.C. Payters, Great Bridge, Tipton and with first week's wages bought a Garrard record player in order to play all the Elvis Presley and Buddy Holly records I had accumulated. I had a good friend in The Jackpots' singer, Geoff Merchant and so he took me along to most of their gigs where I helped carry the equipment." "I was initially interested in drums but decided on bass when Jackpots' bass player, Tony Bradley, offered to give me lessons. I already knew a guitarist named Alan Clee from years before from when we both played with Kate's Hill United football club. I bought a Hofner 'cello' bass - brand new - for 32 pound." "We had no name yet but asked a friend, Kevin Jones to join us on rhythm guitar and Alan Footer as singer. We also had a drummer named Dennis who worked with me at Payters. We rehearsed at the Blue Coat School and the school asked us to play at their Christmas Show." "Albert was soon to be moved to permanant nights at Rymill so, he was replaced by Geoff Crew. Kevin Jones got fed up and left and drummer Dennis had "girlfriend problems" (a common malaise amongst many other groups) and so he had to call it a day. We quickly supplemented Alan Clee and myself with singer Geoff Crew, his brother Graham on drums and Frankie Burns on rhythm guitar to become The Strangers." "Frankie had an Austin A35 van but had not passed his test so, he would drive from Wolverhampton and I would take over the driving to gigs. There were only two other groups of significance in our immediate vicinity and they were 'The Marauders' and 'The Teenbeats'. "The first major gig we did as The Strangers was for a 21st birthday party at The Albion in Tipton but, I can't recall the girl's name. The Jackpots later gave us The Tipton Tavern where we went on to do a significant amount of work." "My dad was a storeman at Payters earning twelve pound per week and I was earning fourteen just from The Strangers plus my piecework day job earnings which were more than dad's. One gig we did for a farmer's party in Prestine, Wales, paid 21 pound - an almost unbelievable sum for a group in those days. Brierley Hill Town Hall was another good payer at ten pound." As an indication of the amount of work available to The Strangers back in those days, a scan of Ken Warr's diary showing..."no rest over Christmas!" can be seen here. The first incarnation of The Strangers ended on Friday 16th November after a successful run of 18 months - a long time in the life of a pop group! Within a week of the changes, bassist Ken Warr was snapped up by Johnny Dark and The Silhouettes. Frankie Burns joined teacher training college. Tony Dalloway; "Following the eventual departure of Geoff Crew in mid 1963 due to business commitments at his newly acquired fruit and flowers shop, The Strangers had three more lead singers (two at the same time for a short period) namely, Johnny O'Hara (ex John Ford and The Classics and The Tremors) who left in mid 1964, Roy 'Dripper' Kent and, Jack Thornton." "Dripper could only manage occasional gigs due to his commitments at teacher training college so, Jack Thornton (Teenbeats) stepped in for a few months until Dripper could return full time in early 1965." The line-up who recorded four tracks for the aforementioned Decca Brumbeat album were, Roy "Dripper" Kent (lead vocals); Jake Elcock (bass/voc); Alan Clee (lead guitar/voc); myself (rhythm guitar/voc); and Mick Aston (drums). John O'Hara went on to join The Black Diamonds who morphed into the highly successful recording stars, The Californians. "When the mob hit the pub they had to make a sharp exit to avoid being cornered"
Tony Dalloway; "We had residencies at Dudley Jazz Club (Monday evenings for two years), The Hilly Fields, (Sunday lunchtimes) The Caves, Priory Estate, Dudley, The Lost City, Moat Farm Estate, Tipton and The Staffordshire Volunteer, Bushbury, Wolverhampton. The latter three were often frightening experiences with fights a common occurrence." "There would be raids and counter-raids by the warring factions of The Lost City and The Caves. The Lost City pub (officially The Drayton) was situated in the Moat Farm council estate. The actual estate itself was nicknamed The Lost City because there was only one way in and one way out (even the sign on the bus said, Lost City) so, when the mob from The Caves hit the pub they had to make a sharp exit to avoid being cornered." "It was our singer Dripper who introduced The Strangers to rhythm and blues music so fifty percent of our repertoire was R&B. The other half was Chuck Berry, Jerry Lee Lewis, Ricky Nelson, and The Beatles." "The Strangers changed their name briefly to The Martells to avoid confusion with other groups of the same name before eventually settling on Finders Keepers to coincide with a stint in Germany and a new recording contract. The line up prior to turning professional was Ralph Oakley, Dave Williams, Jake Elcock, Alan Clee and Roy Kent but, Ralph Oakley left to form The Montanas so Finders Keepers continued for a while as a four piece." "The lifespan of The Strangers had been from 1960 to 1965. When Finders Keepers turned pro, Mick Aston and I left to form Two By Two with singer Bob Shelley from Dale Gibson and The Detours and guitarist Bob Lightfoot." "The Strangers got back together in 1973 with Mick Aston, myself, Dripper Kent and Alan Clee of the originals along with newcomers John Thompson (guitar) and later vocalist, Brian Griffiths (replacing Dripper). This incarnation called it a day in mid 1977." "From 1965 to 1974 I was with The Don Howard Band. I undertook teacher training and then joined Giggetty in 1981 when they had already been going for twenty one years. Alan Clee was also a member for a while. The years were very creative with The Strangers. It gave me a stepping stone to becoming a jazz musician and an overall insight into music generally. As well as guitar, I also play double bass and keyboards." Of recent times, Alan Clee, John O'Hara, Jake Elcock and Dripper were founder members of a local 'supergroup' called "The Crockers" (now disbanded) and Geoff Crew and Tiny Bradley are members of "The Rinkleybeats" who perform mainly for charity events. Ralph Oakley of course, is a successful author. The opening track on the Decca BRUM BEAT LP was recorded by The Strangers. It was a catchy original song composed by their vocalist Roy "Dripper" Kent titled 'What A Way' and was certainly good enough to have been released as a single in its own right. The Decca Brum Beat album included notes by 'Midland Beat' newspaper editor Dennis Detheridge who wrote; "But is there a Brum sound? This album surely proves beyond doubt that the answer is "No." The reason: all the city’s groups including those heard on this LP are striving to achieve some degree of individuality. Thus, they are unlikely to produce the same sound." The Strangers became the nucleus of the well known West Midlands group "Finders Keepers" when Roy Kent, Alan Clee and Jake Elcock formed that group in 1965 (see Finders Keepers). Some sad news is Strangers founding member and lead guitarist Alan "Cleebo" Clee passed away at age 71 due to a stroke on April 7, 2016. Alan was also in Finders Keepers and went on to play with future members of Deep Purple, Judas Priest, Whitesnake, and Black Sabbath. While not quite making "the big time" himself, Alan's talent as a great guitarist was known by many. NOTE: The Dudley "Strangers" should not be confused with another group called "The Strangers" from Ireland who recorded for the Phillips Records label in the late 1960s.